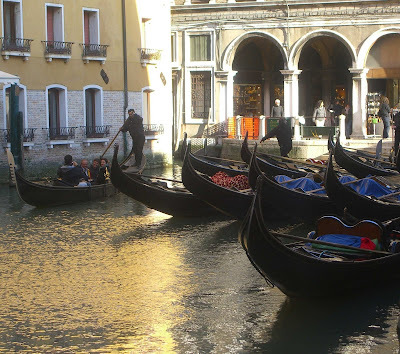 After a failed first attempt at an unforgettable dinner of lagoon seafood and an insipid lunch, we were determined to discover the tasty side of Venice’s food scene. We knew it was there, and we weren’t going to give up! There is one way to experience the local gastronomic scene that never fails: figure out the local tipple, and laze away an afternoon consuming it. 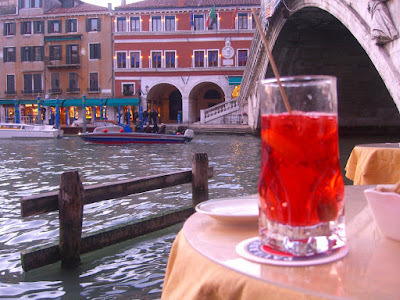 That’s how Phil and I found ourselves canal side next to the Ponte Rialto, sipping on spritzes and nibbling potato chips and olives as the sun dropped down. It’s impossible not to like the spritz – it’s fizzy, festively pink, refreshing, and can be sweet or bitter, depending on your preference. Essentially the spritz is ice, bubbly prosecco, fizzy water, and an aperitif of your choosing. I like bitter drinks, so I order mine with Campari, but you can go slightly sweeter with Aperol, Select, or Cynar. The evening was off to a great start. And things only got better from there. Trattoria da Fiore is a cozy little place right off the Campo Morosini, only a five minute walk from our hotel. Da Fiore serves a dual purpose: as a bacaro/ chicchetteria, and as a trattoria. Chicchetti and wines and spritzes are served in the bacaro and I must say that the chicchetti on offer looked infinitely more appealing than those I’d had the previous night. 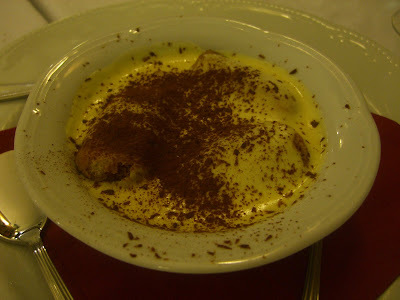 And the meal we had in the trattoria was spectacular – finally! 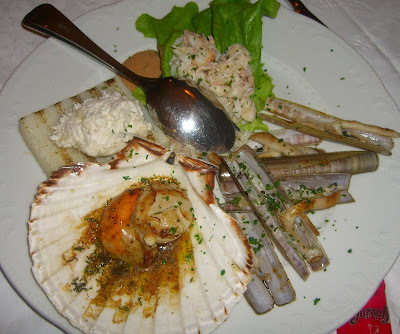 We started with the antipasto fiore – a plump scallop (with the roe still attached), steamed crab, a salad made of some sort of white fish on a square of grilled white polenta, and a pile of razor clams. 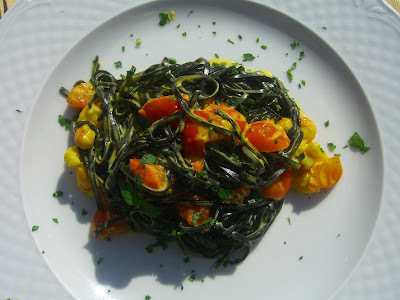 I was especially looking forward to the razor clams, or capelonghe as they’re called in Venezia. They really do resemble old-fashioned shaving razors, and the long meat echoes the thin shape of the fragile shell. 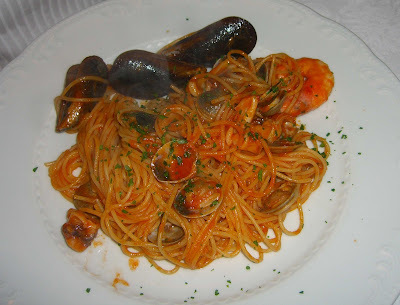 Laurie ordered the spaghetti ai frutti di mare- mussels, clams, scallops, shrimp, and calamari in a simple tomato sauce. Also on the table was a prawn risotto with asparagus. 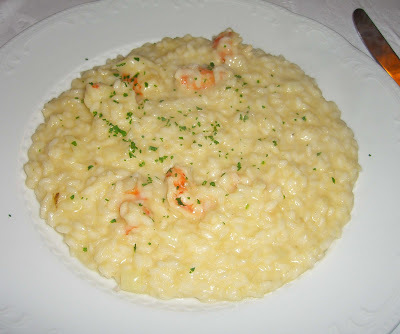 The shellfish broth used for the risotto infused the entire dish with the taste and aroma of the sea. We ordered a tiramisu to top off the evening. All in all, the seafood was impeccably prepared and obviously fresh. Way to go. Can you believe that our food experiences got even better the next day??!! 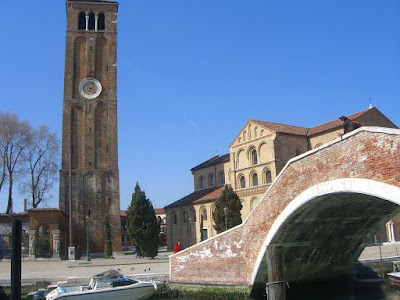 We booked a boat ride through our hotel to the island of Murano for the following afternoon. 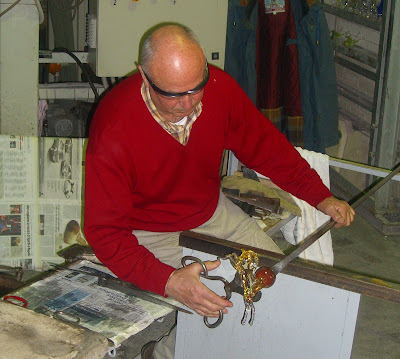 Murano is where all that famous Venetian glass is made. 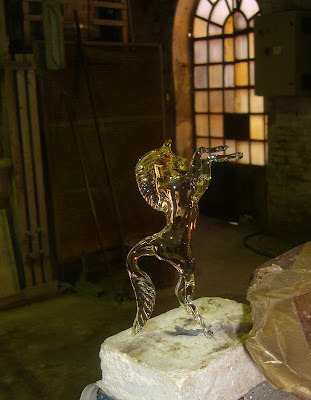 We watched a glass blower dexterously create a horse for us. It seemed to appear out of nowhere and he created this masterpiece in under two minutes! We worked up an appetite poking around in the glass shops and picking up a few souvenirs. It was a chilly day but the sun was smiling on us, so we decided to grab lunch on a deck over a canal. Maybe because I was starving, or maybe because the meal was so mind-blowing that I blocked out everything but the seafood on our plates, unfortunately I did not catch the name of this amazing restaurant. Murano is tiny and this place was just around the corner from the square with the famous tower and bridge. Look for it if you’re there!!!! My tagliolini neri with prawns in a tomato saffron cream sauce seriously hit the spot. 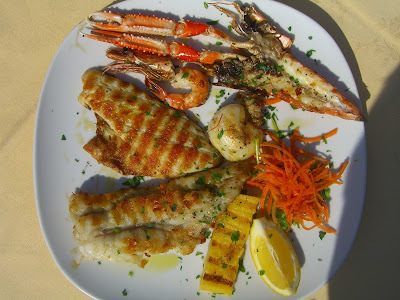 Ditto for Phil’s mixed grill with crab, langosta, two types of white fish, and calamari garnished with that ever-present grilled polenta square. And Laurie ate her scallops in parsley butter in silence so she could savor them without distraction. 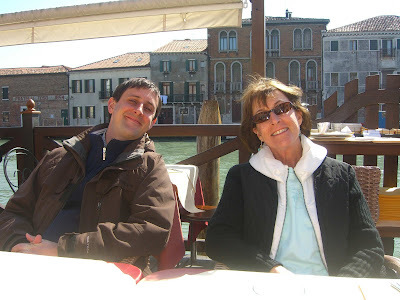 This lunch proved me wrong by showing that you CAN randomly happen upon a good meal in Venezia – just make sure you eat your random meals off the major tourist track. Dinner our last night in Venice was at a recently renovated place called Ristorante Pizzeria Rosa Rossa, also around the corner from our hotel. Phil and I had grabbed drinks there the night before and Cristiano, the owner, and his staff were so unbelievably kind and generous that we took them up on their offer to dine there the following night. Cristiano remembered us and took care of Phil and me throughout the night. 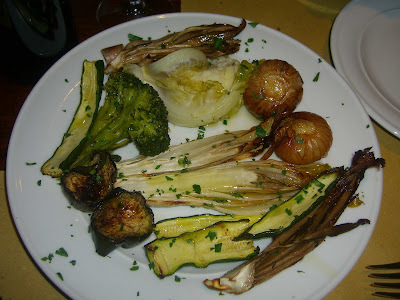 We started with antipasti vegetale with roasted onions, zucchini, broccoli, cauliflower, eggplant, and radicchio. He was actually directly translating salame di cioccolato to English, and it sounds way funnier that way. 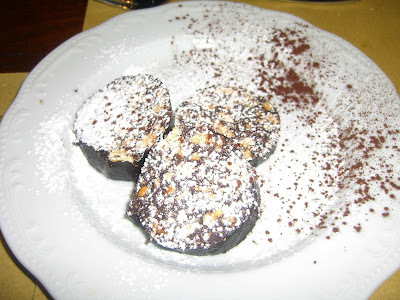 It was a really rich chocolate roll studded with hazelnuts, sliced into rounds and topped with powdered sugar and cocoa powder. A fantastic casual meal to top off our few days in Venice. 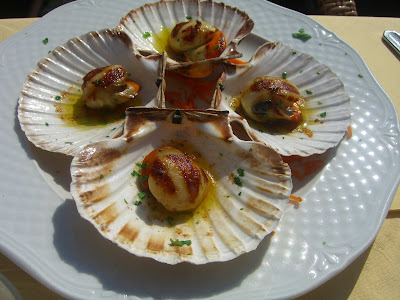 Love how they leave the roe on the scallops in Europe - its the best part! Australians are finnicky about it! And those razor clams look interesting - have to say I have never heard of them. That is something that has piqued my curiousity big time! 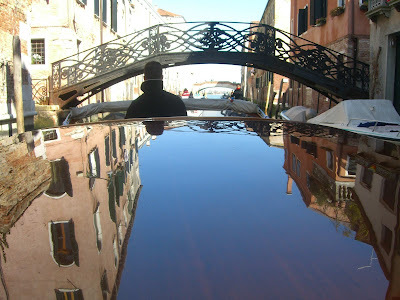 And how amazing is Murano? 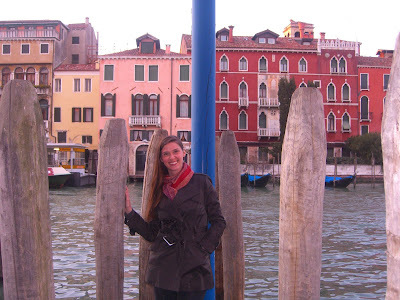 I loved it, Venice is one of my top destinations!